After a rewarding but hands-on week of guests from breakfast to dinner time, we awoke this morning in an empty house. The only sounds were familiar ones: Beau’s bells and his pleading cries for food–poor starving mite! The golden Orioles flew hither and thither warbling bonjour. Good to have them back–heralds of the beginning of something–though these days the weather is so changeable you cannot be sure what season it’s trying to be. 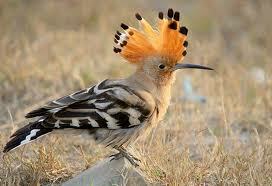 The Hoopoes spotted up the road would confirm it’s summer that approaches. Our neighbor, Serge, called by at 9am with a box of his hens’ very brown and very large eggs–as he had promised to do a couple of weeks back, even before Meredith presented a pot of honey to him on her diplomatic honey run. 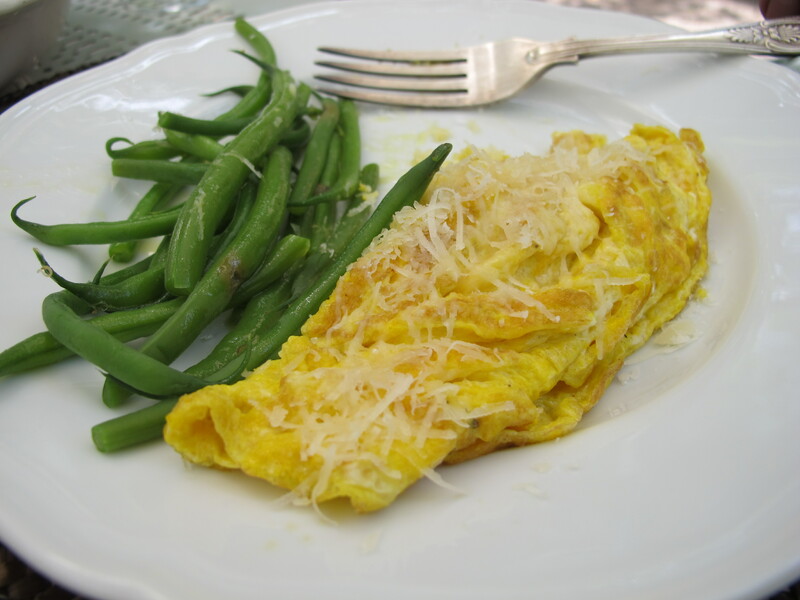 They are extraordinarily brown and made deeply yellow and satisfying omelets for lunch under the greening fig. The tree’s first fruit crop is fattening fast after so much rain. 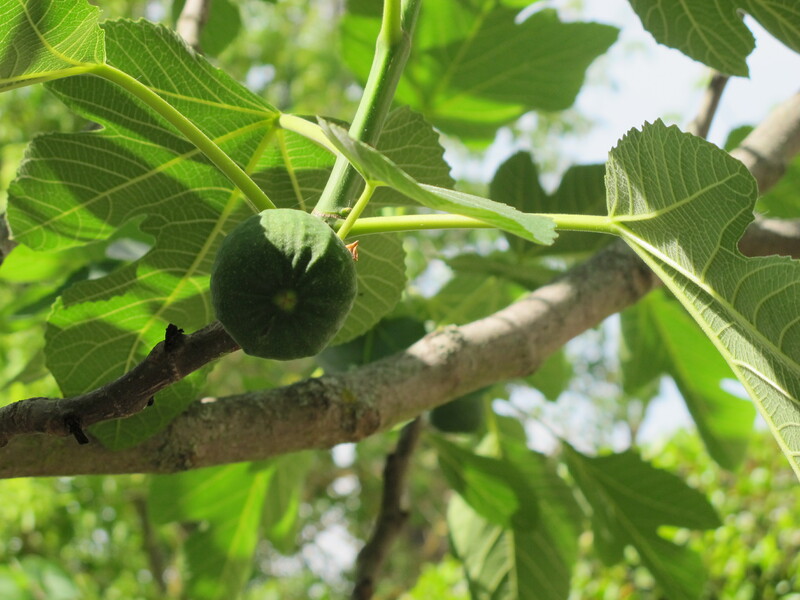 These early figs always promise more than they deliver. We have to wait ’til August for the second crop. A whiff of donkey dung challenged the senses at lunch under the fig tree and reminded us of the party on Saturday in the courtyard. It was graced by Sybil, who demonstrated her initial doubts about attending by marking her patch with a pile, almost green as the figs above! Later, after all the attention lavished upon her, she startled everyone with an enormous HEE–HAW of appreciation, which won her even more pats and plaudits. Beau Bells! Does this mean your latest addition is a cockney? The eggs look gorgeous. Are you sure they are not chocolate? Has your neighbour got marans? I hope you have had plenty of enquiries for your cookery course. Brilliant well done Sybil. You have to express your views somehow. I Have never seen a brown egg, I don’t think it is possible to find a similar egg in sicily. The omelette should Have been very good! Thanks for the enjoyable updates. Beau? Starving? Can’t imagine any creature starving at your home. Loved the color of the eggs. All we had in NZ were very brown eggs with deep orange yolks–but yours look deeper in color, almost a red shade. Super full-bodied flavor. Enjoy! I’m sure all your guests had a great weekend. Good job, Meredith! Amazing! Brown eggs are light to medium dark brown but these are… chocolate brown. What breed hens does your neighbour Serge keep? What a gorgeous and so proud is this little bird. Is it the Golden Oriole? Australia is very rich in native birds. Different species seem to trive in different parts of this Continent. I recall having made a comment some weeks ago that you live in Paradise. Today I repeat it. You do! Bless you both. Robin those eggs are a serious brown, and that omelette looks very appetizing. You have some very interesting wild life in your neck of the french countryside. What a marvelous sight it must be. Finished your book over the week-end Robin and really enjoyed every page,I already have the first two books,but loved reading it from the start to the present.Enjoy your wonderful life,and thank you so much for sharing it with us. Your blog continues to be a joy to read. I love the bird,its beautiful. What a beautiful bird! I’ve never seen this before. It’s great, isn’t it? Being close to the animals and the earth–always changing and never a dull moment. That is one fabulous bird! AHH! Those red eggs are phenomenal. What chickens produce that color? Not sure of the name but they are burly, black and magnificent. Robin, no idea hoopoes visited France, but I’m sure they know what they are doing in your immediate environs! Thank you for the ornithology lesson and the brown eggs; I’m so jealous! 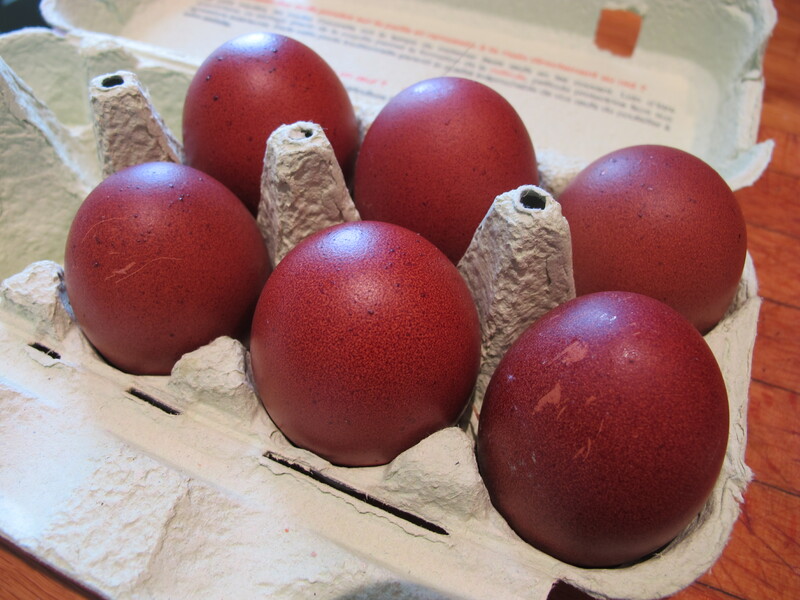 Question on the eggs–are they as red-brown as they look? What type of chickens? Everyone who’s seen the picture is wondering. I will ask Serge, the owner.